Successfully Added HD 1080p Trail Camera "Camo Cam" - IP65, PIR, 20M Night Vision, 1/3 Inch CMOS, 0.6 Sec Trigger, 2.4 Inch LCD to your Shopping Cart. 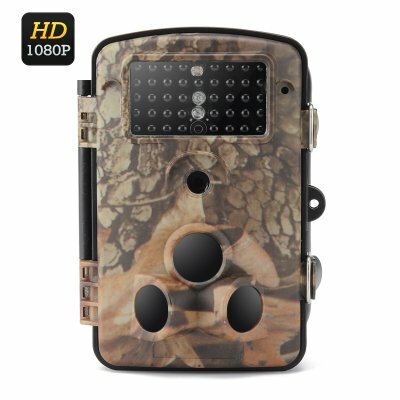 The “Camo Cam” is a stunning 1080p HD wildlife trail camera that lets you capture animals in their natural environment without disturbing them so you can scout out a given area before the hunting season starts and find the best locations to set up your blind. So whether you’re scouting out future game, looking for prime hunting locations or just want a clearer picture of the wildlife around you this “Camo Cam” is the answer. It can record high definition video and photos over days or even weeks. Once set up this 1080p imagery will bring you a detailed understanding of the wildlife present in any given area. If you enable the wide angled 120 degree PIR sensor the camera can easily detect movement up to 20 meters away and this can be used to trigger video recordings or photos so as the camera can monitor game trails autonomously, all this can be saved on micro SD card for review later. With a 0.6 second trigger time it can quickly snap a shot once the target has entered the detection zone and the 20 meter night vision brings great results even on dark nights. The “Camo Cam” has a 108 degree field of view ensuring the full scene is captured while the 1/3 inch CMOS and f/2.0 allows for some stunning shots for quality results. The time laps photography function means the camera can be set up to snap photo at pre determined intervals allowing you to capture all the animals as they pass by, no matter how big or small and with an IP65 rating its well protected against the weather. The is a real time saver for serious hunters and conservationists as it will bring a detailed overview of an animal’s stomping ground, it can also aid film makers and wildlife management by showing a sample of the ecosystem in a given area from which you can determine the health of the environment. Get ahead of the game with this HD trail camera to make sure you dont go home empty handed this hunting season. This HD Trail Camera comes with a 12 months warranty. Brought to you by the leader in electronic devices as well as wholesale outdoor cameras and gadgets..